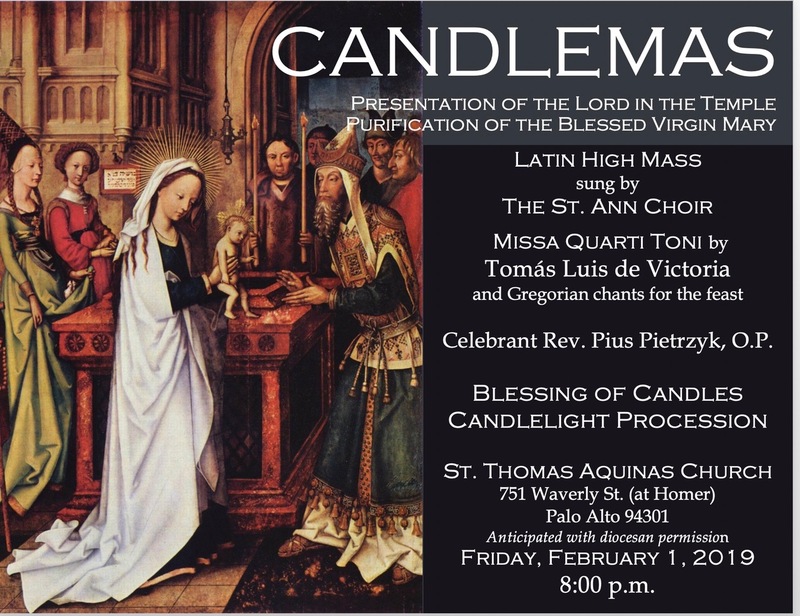 On Friday, February 1st, the St Ann Choir will sing a Latin Mass for the feast of the Presentation of the Lord and the Purification of the Virgin Mary (anticipated, for logistical reason, with the permission of the local diocese), at the church of St Thomas Aquinas, located at 751 Waverly St (at Homer) in Palo Alto, California. 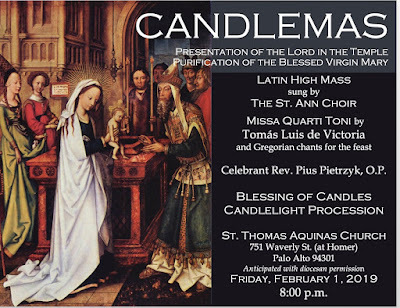 The music will include the Missa Quarti Toni by Tomas Luis de Victoria, one of his motets, and the proper Gregorian chants; the Mass will begin at 8 p.m.
On Sunday, February 3rd, the Church of the Immaculate Heart of Mary in Belmont, California, will have a Mass of the external solemnity of Candlemas, beginning at 4:30 p.m. with the traditional blessing of candles and procession, and followed by the blessing of throats for the feast of St Blase. The church is located at 1040 Alameda de las Pulgas. 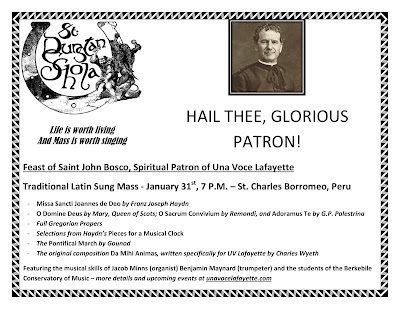 The Una Voce chapter of Lafayette, Indiana and the St Dunstand Schola are sponsoring two Masses in the next couple of days. 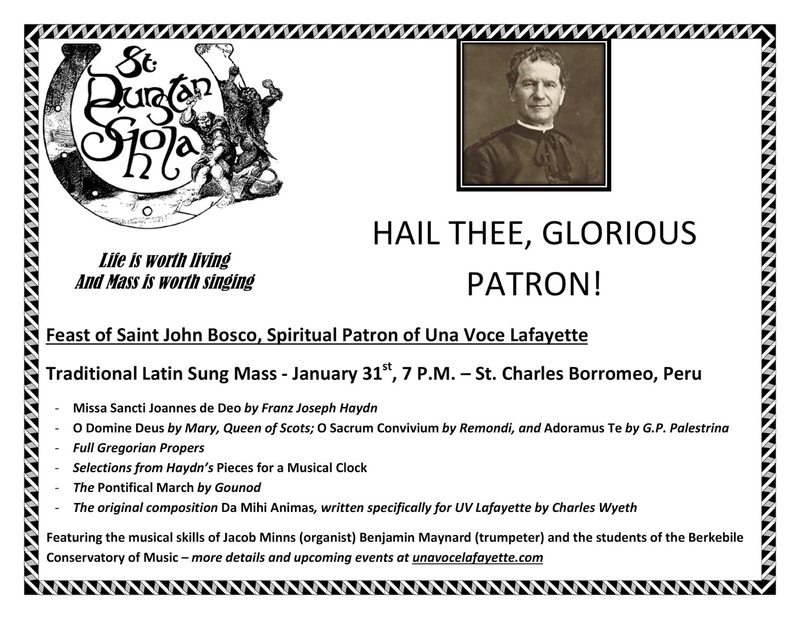 Tomorrow, for the feast of St John Bosco, the group’s patron, a Mass will be sung at the church of St Charles Borrromeo in Peru, Indiana, starting at 7 pm, and featuring the music of Haydn, Palestrina, Gounod, the Gregorian propers, and an original composition by Charles Wyeth commisioned by Una Voce Lafayette. 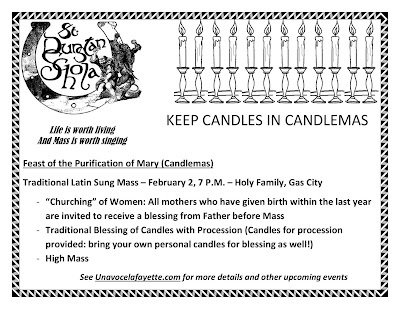 The church is located at 58 West 5th Street. 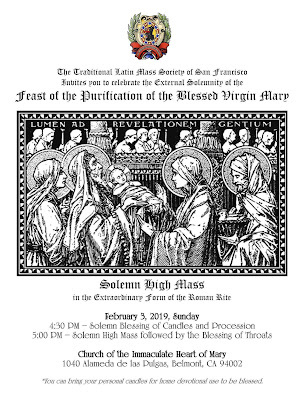 The following day, the feast of the Purification will be celebrated at the church of the Holy Family, located at 325 East North A Street in Gas City, Indiana, beginning at 7 pm. 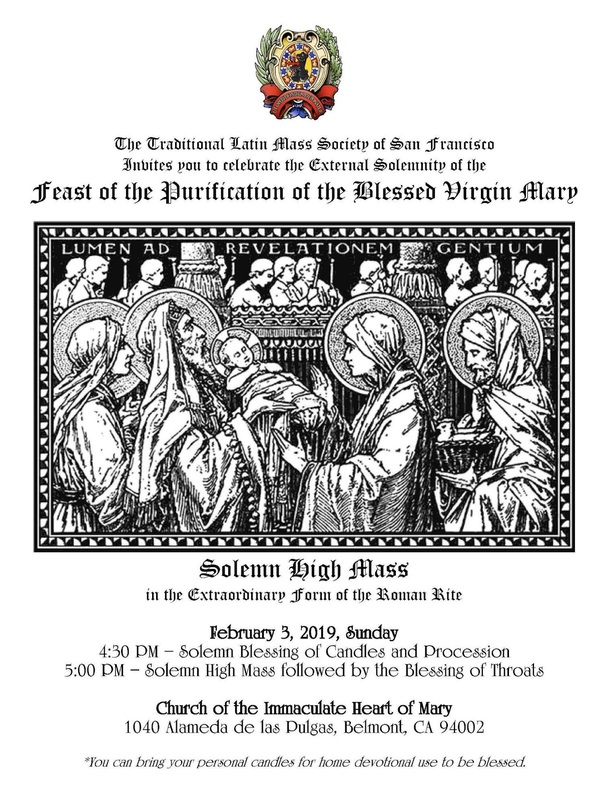 Before the Mass, the churching of women will be celebrated.